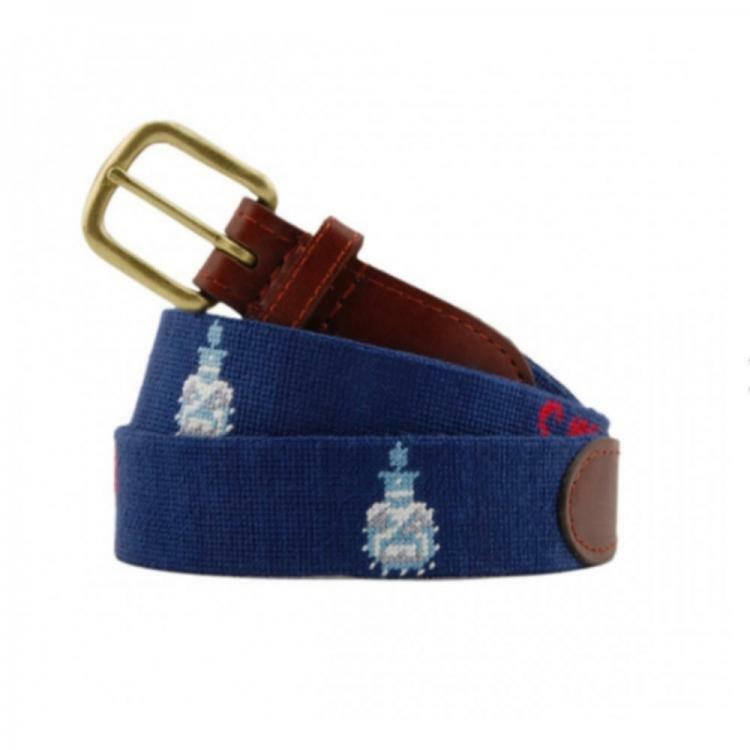 The iconic Citadel Bulldogs mascot Spike and historic Big Red are both incorporated into the exquisite design of this handmade needlepoint belt. You may add a monogram to your belt, but be aware it takes up to 6 weeks to receive your belt if you monogram it! If you do not want a monogram, just skip that step. We have spotted our traditional needlepoint belts at cocktail parties and at the office, but they are also perfect for a day on the water, the links, or a night at your favorite watering hole. Wherever you may be, your belt will set you apart from the average waist. Smathers and Branson produce a top quality handmade needlepoint belt. The fact that it is made by hand allows for more detail to be included in the design. All needlepoint is affixed to soft calfskin straps with solid brass buckles. Please note - Monogrammed items take up to ten weeks for delivery. IMPORTANT SIZING INFORMATION: We recommend adding 2 inches to a men’s pant size to obtain the best Smathers & Branson belt size. For example, someone who wears a size 36 pant would wear a size 38 belt. When the waist is an odd size, increase the belt size by 3 inches (ie: a size 33 wears a size 36 belt). If you are looking for another school, we can probably custom make it for you; there are over 70 schools to choose from. Email us at Quotes and we will get right back to you about your request. Most schools have the belts, wallets and key fobs. Some have coasters, flasks, hats, cufflinks, coasters, throw pillows, ornaments and tote bags available as well! Price: $175.00 In stock! - Browse this brand: Smathers and BransonOur products are custom made to your specifications. This product ships up to 2 weeks after your order is placed. Our belts are 2 inches larger than your pants waist size. Example: A pants waist size 36, wears a 38 inch belt. When the waist is an odd size, increase the belt size by 3 inches (i.e. a size 33 wears a size 36 belt).